The BetOnline Poker room runs on the Hero Poker software, offering numerous cash and tournament poker games to its members. This is a great site for both poker novices and experts. Here is more information on BetOnline.com Poker. BetOnline Poker is one of the latest entrants into the world of online poker, although the BetOnline management has been in the industry since 1991. 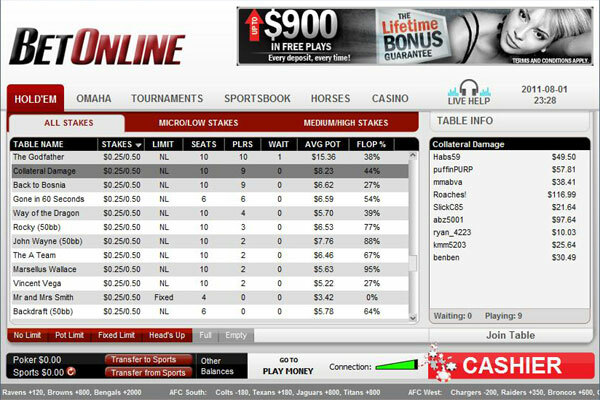 BetOnline Poker had started in the year 2011, and is among the fastest growing poker rooms today. The site attracts a lot of traffic, especially new players, which makes it a great place for experienced players to make some money. One reason for its increasing popularity is that BetOnline Poker also accepts players from the US, while most other poker rooms and casinos do not. BetOnline Poker offers only the Lifetime Guarantee bonus and the Tournament bonus guarantee. The site does not have any specific welcome or loyalty bonuses, although it does have a few promotional offers to entice players. Lifetime bonus – The lifetime bonus scheme allows you to get a bonus of 200% on all your deposits, starting with your initial deposit. If the deposit is made through a credit card, the bonus is limited to 200% of the deposit. This is an attractive feature as it guarantees a bonus on all the deposits you make to wager on poker, betting or any other casino games on the site. The minimum deposit to earn this bonus is $50, and to redeem this bonus amount, you will have to wager 6X the rollover requirement for lifetime bonus. Tournament bonus – This is one of the best promos of BetOnline Poker. Under this scheme, players who make a deposit of $50 also get 200 promo bucks, besides the 25% lifetime guarantee bonus. These promo bucks are optional, which means you have request for them to get the benefit. The best part about these promo bucks is that they can be used to gain entry to all the poker tournaments held on the site. However, the maximum promo bucks you can get per deposit is limited to 4000. At BetOnline Poker, you can enjoy the popular Texas Holdem variant, and also the Omaha poker variant. Players of BetOnline Poker can choose from a variety of freerolls, sit n gos, cash games and guaranteed tournaments that take place regularly on the site. 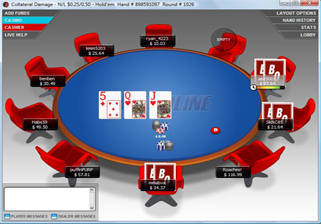 The table size you can choose on this site can be 6-Max, 8-max, heads up and full circle. One of the best ways to learn the game is to take part in the daily freerolls that take place every hour. If you are experienced and want to make some easy money, you should go for the guaranteed tournaments with lesser players. Deposit methods accepted by BetOnline include Visa credit, debit and prepaid cards, Person to Person online payment transfer, MoneyOrders, Moneybookers, Neteller, Bankwire, Book to Book transfer and check. Payouts are usually made through the same methods used for deposit. Sometimes, BetOnline can deposit your winnings directly into your bank accounts by levying a charge. All the deposits and withdrawals are made through secure pages that are encrypted, which makes BetOnline Poker a safer option.